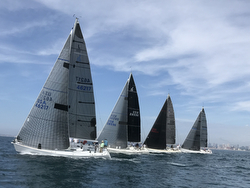 (San Diego, CA)- This year’s J/Fest San Diego was hosted by San Diego YC, with racing taking place off the beautiful Point Loma promontory and the broad, sweeping beachfront off the city of San Diego. 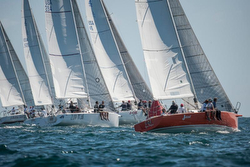 The fleet was blessed with sunny skies and moderate winds for the two day event, with the one-design fleets of J/70, J/105, and J/120 enjoying a total of five races each. In the J/120 division, it again saw an amazing first day performance from the legendary John Laun, racing the infamous CAPER, posting an all bullet tally for three races. Not far off his heels was Ernie Pennell’s MAD MEN with a 2-2-3 to take second for the day. However, what ended up happening on the Sunday Funday finale was a surprising turn of events. It appears that Chuck Nichols’ CC RIDER found a can of “whupass” on Saturday night, rolled out of bed with no hangovers, and proceeded to post the same record as Rudy Hasl’s HASL FREE, each getting a 1-2 and tied for the day’s awards. As a result, Laun’s CAPER managed to hold on to their huge lead, despite a 4-3 on Sunday, to take class honors. However, the balance of the podium was determined on a tie-breaker! Nichol’s CC RIDER taking the silver on countback from Hasl’s HASLE FREE who settled for the bronze. With a solid turnout of ten J/105s, it is never surprising the competition would be tight. In the end, it was Chuck Driscoll’s bright-safety-orange JUICED that took the class title with a 3-1-1-3-1 tally for 9 pts. Stew Cannon’s J-OK kept a close watch on every move by the JUICED team, but could not match them for the series, posting a 1-3-2-2-2 for 10 pts total to take the silver. Rounding out the podium was Ed Sanford’s CREATIVE with a 4-2-3-1-3 for 13 pts total. The balance of the top five included Steve & Lucy Howell’s BLINK! in 4th and Rich Bergman’s ZUNI BEAR in 5th place. In the J/70s, it was Kim Kundrak’s PERSEVERANCE 3 that swept her races to take the class win. They were followed by Tom Garrett’s SLOOP JOHN B in second place with 10 pts and by Sarah Wyman’s NUNUHUNU in third position with 13 pts. For more J/Fest San Diego sailing information Add to Flipboard Magazine.